H mazing and fun! These are words I use to describe Hall-effect sensors. You probably already own several of them. Automobiles use them to detect speed and relative location of rotating parts. Hall-effect sensors are also finding their way into consumer electronics. In fact, almost any application that requires a long-lived switch can use them. This article presents a circuit that uses a Hall-effect sensor to measure DC currents up to 200 amps. A Hall-effect sensor is a magnetic field detector. A standard Hall-effect sensor acts like a simple switch. In the presence of a southern magnetic field, it turns on; with no magnetic field or a northern field, it turns off (N and S sensitivity is dependent on which side of the sensor the magnet is on). Unlike a mechanical switch, the Hall-effect sensor has no moving parts. There is nothing to wear out or collect dirt. The fact that Hall-effect sensors are found in the engine compartments of automobiles attests to their durability. Hall-effect sensors also come in the linear variety. A linear sensor responds to the intensity of a magnetic field. As a magnet comes closer to a linear Hall-effect sensor, its output rises; as the magnet moves away, its output decreases. Electricity and magnetism are closely related—you could say one doesn't exist without the other. Electrons flowing in a wire will cause that wire to have a magnetic field. A linear Hall-effect sensor placed near this wire will respond to the intensity of the magnetic field. As the field grows (current increases), so does the output of the Hall-effect sensor. The linear Hall-effect sensor acts as an accurate current sensor. The current measurement system in a typical DC system consists of two parts—a meter and a shunt. The meter is mounted in a location that's convenient to the operator. The shunt is installed in the circuit between the battery and the load. A shunt is a small-value, precision resistor. Atypical 100 amp shunt will have a resistance of 0.001 ohms. If 100 amps is flowing through it, it will have a voltage drop of 100 mV. The meter measures this voltage drop and displays it as 100 A. • Lack of isolation—a shunt resistor and meter are part of the main battery circuit. For safety, they are usually placed in the negative side of the circuit. Little current will flow if the shunt becomes shorted to ground. Care must be taken not to short out both sides of the shunt, or else the current meter will not read correctly. • Power dissipation—when a shunt resistor is used to measure current, you are actually measuring the voltage drop across the resistor. By definition, you are burning up valuable power. If 100 amps is flowing through the 0.001 ohm shunt, 5 watts of valuable power is wasted. The circuit presented in this article has none of these deficiencies. The Hall-effect current sensor has no electrical connection with the circuit under measurement. The sensor circuitry uses only 15 mA (0.2 W at 12 VDC) while performing measurements, and can be turned off when not in use. Close-up of the Hall-effect sensor and stabilizer capacitor. A major advantage of the Hall-effect current sensor is its isolation. It may be placed on either the positive or negative line. It is shown here measuring current in a positive line. An Amploc linear Hall-effect sensor forms the heart of this project. Data sheets are available at www.ampsense.com. This project works with Amploc's XL, Pro, or Snap Clamp series of sensors. You can select a 5 to 200 A sensor to fit your application. The current sensor is easy to install. Simply take the wire whose current you want to measure, and pass it through the aperture of the sensor. The Snap Clamp sensor is especially easy to use since you don't have to break any wire connections to install it. You simply assemble it over the wire. 1. 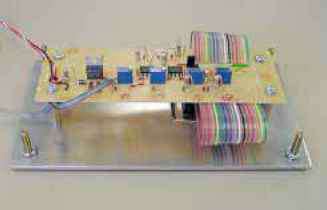 Power: A 7805 voltage regulator provides the required regulated +5 VDC to each block. Digital or analog sensors have a quiescent (offset or zero current) voltage of about 2.5 VDC. Using the XL100 as an example, the quiescent voltage is 2.5 VDC. If the sensor is measuring 100 amps, its output voltage will rise to 4.6 VDC. Watch out for the direction of current flow! The 2.5 to 4.6 VDC voltage range is true only if current is flowing in the direction of the arrow located on the current sensor. 3. Buffer: The buffer takes this raw voltage (current data) and converts it to a 0 to 5 VDC output. The 0 to 5 VDC full scale was chosen to make calibration of the display easier. 4. Display: A Red Lion Controls display was used for this project. The display is simple, easy to use, and relatively inexpensive. 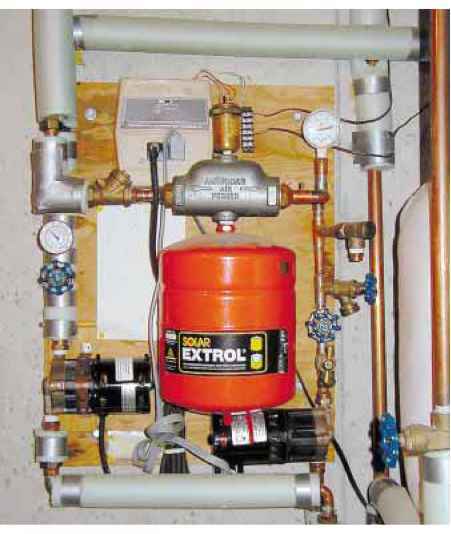 As an alternative, an analog meter could be used. The photo at right shows the circuit in operation using an analog meter that I salvaged out of an old transmitter. Refer to the circuit schematic on the opposite page. Voltage regulator U3 provides a regulated +5 VDC to all circuits. Capacitors C2 and C3 stabilize the circuit. Diode D1 and resistor R12 provide polarity and short circuit protection. The sensor is a Hall-effect current sensor. 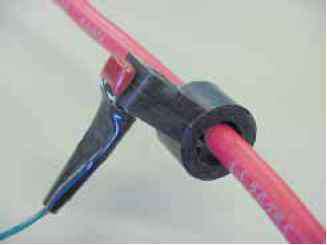 Its output is proportional to the current flow in a wire that passes through its aperture. The sensor requires a regulated +5 VDC. Capacitor C1 stabilizes the sensor. C1 should be placed as close to the sensor as possible. An analog meter may be used in place of the digital display. operational amplifier was chosen for this application because of its superior operation in a low voltage environment. Switch S1 is used to calibrate the display. In normal mode, S1 passes the output of U2 to the display. When S1 is in the calibrate position, +5 VDC is passed to the display. Resistor R8 is adjusted so that the display indicates full deflection. If a 100 amp sensor is used, R8 is adjusted until 100 A is read on the meter. A Red Lion MDMV display was chosen for this application. The display requires +5 VDC to operate. It draws less than 1.0 mA, making it ideal for this project. 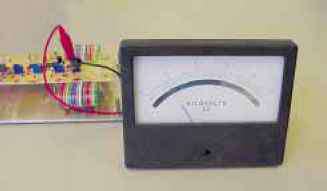 The display measures DC voltages from 0.00 to 199.99 mV. Resistors R8 and R9 step the 0 to 5 VDC output of U2 down to this low level. Resistors R10 and R11 are used to zero the meter. There are two ways to calibrate this circuit. The best way is to compare it to a known, accurate ammeter. Insert the ammeter in series with the circuit you want to measure. Adjust the Hall-effect circuit until it is accurate. Second best is to calibrate it by sampling a known current. This is an exercise in Ohm's law. If you know the voltage and the resistance of a load resistor, you can determine the current. A 1.0 ohm resistor makes the math easy (if R = 1.0, voltage and current are equal). Remember, whatever you use, to make sure that it can dissipate the power. My "little" 225 W resistor tried to melt its way through my workbench! Close-up of the completed unit, face down.